I’m with Clockwatcher on this drama – I’m just not sure what to think. I seriously adore it but then show decides to add millions of flashbacks that we’ve already seen, which drives me crazy and I come away angry. Then I watch the episodes again and am delighted, laughing my bum off. UGH, I don’t know! 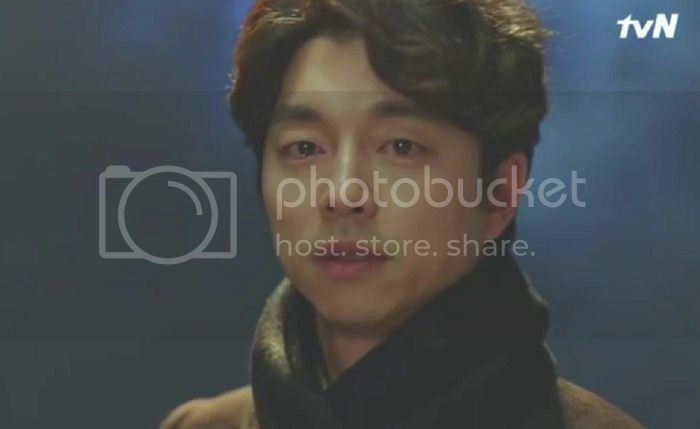 Anyhoo, so this week we found out that Eun Tak can grab the sword and pull it out but our lovely Goblin doesn’t appear to want that anymore – he’s not ready to die. My guess was that there needed to be feelings of love between the Goblin and his bride before she could pull it out but if that’s the case, it happened awfully quickly. He loves her and she loves him already? That was fast. There is also still the mystery of our Grim Reaper and his reaction to seeing the painting of the Queen, who he finally finds out is Goblin’s little sister. I don’t think this necessarily means Sunny is the reincarnation of the Queen but he did cry when he first met Sunny just as he cried when he first saw the painting of the Queen. I’m hoping the writer will stop trying to fill the story with bazillions of flashbacks and get this thing moving forward. No preview this week indicates they might already be in live-shooting. Then there is the old woman/hot lady in red – why is she suddenly appearing before Goblin and telling him he has to die SOON or Eun Tak will die? What the what? That’s so not right! I think we all need answers but show is reluctant to give them because we have a long ways to go yet. *sobs* At least Eun Tak learned the truth about what will happen if she pulls the sword out – which I’m guessing will make her refuse to do so. So are we left with noble sacrifices on both sides – he needs to die so she won’t and she’s willing to die so he won’t? My favorite scene of this week (among many) was Goblin and Eun Tak watching the movie “Train To Busan“, which starred Gong Yoo – I’ve seen the clip below quite a few times and still laugh so hard I’m almost crying. Brilliant! I hope the quirky, funny relationship between Goblin and Grim Reaper continues, it’s one of the best things about this drama! I’m very much looking forward to next week, see you all then! I do think Sunny is the reincarnation of the Queen. I mean the fortune teller asking her parents to name her Kim Sun (I.e. Sunny) is a dead give away. 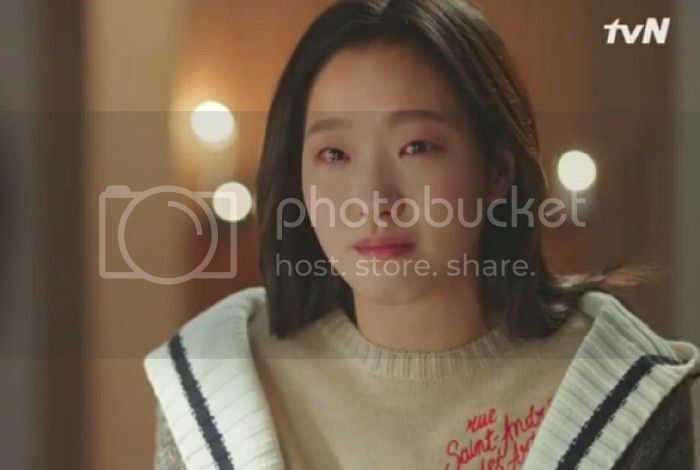 Plus the reaction of the Grim Reaper to her Plus her reaction to the ring – I guess the show couldn’t be any more explicit, especially when Grim Reaper clutched his heart when his name was written in the memorial ceremony. The lady in red in their mythology and according to the drama she is Samshin, goddess of birth and fate. 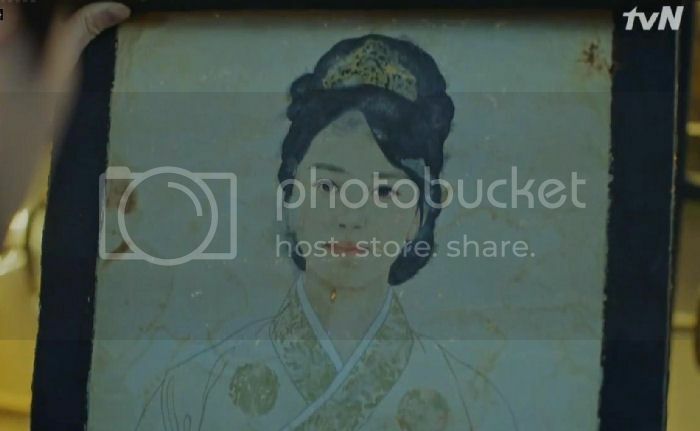 She apparently makes people being born, see both Eun-Tak, Shin as her children, she was happy to create She is huge in korean mythology and in this drama she is second only to the sky god apparently. In her God Pov she is trying to save the two of her human children from the pain on their way. Nothing suddenly she is almost THE God when she creates lives. Also…. (just finished watching 7 and 8) loved the throwbacks to Cheese in the Trap. The lake she is walking by, I believe, is the lake in Cheese. And Goblin’s comment about how he ‘almost broke his (the baseball player’s) wrist’ and ‘should have let him play piano’ had me LOL. You really need to watch and rewatch this to catch everything…well, some of us do! For me it actually made sense for that twist revealed by Samshin Grandma bec once Euntak finds out what happens when the sword is pulled out, she can just refuse to do it. And they could live the rest of her human life before pulling it out and they can die together. But now, that future is impossible so narratively this makes their conflict richer and more complicated. Also I am enjoying all the flashbacks to the past, not so much as the flashbacks in the present time that happened about 15 mins ago in screentime. But it’s not a deal breaker because I unreasonably still love this drama a million times over. I guess the grim reaper was the king that’s why he cried when he saw the queen, the ring, and sunny.